I woke up kind of early this morning, and just couldn't sleep. I went downstairs and the kids were sleeping in the living room (rather than the basement, where they'd been sleeping), so I couldn't do e-mail or watch TV. For lack of anything else to do while everyone was sleeping, I decided to go for a run. Normally, I run on Mondays, Wednesdays, and Fridays--but I had to run on Tuesday this week, so I wasn't planning on running today. I decided to just run from my sister's house, so I didn't go to a trail or anything. I ran through her neighborhood, and then onto a busy street that had a wide sidewalk. I followed the sidewalk until it ended--a disappointing one mile. I was really frustrated with the amount of stop lights (probably about 5?). Then I just turned around and headed back, circling her neighborhood and doing whatever I could to get in 50 minutes (today's run was supposed to be 20 minutes easy, 20 minutes at tempo pace, and then 10 easy). I didn't really follow that structure, though. I ran 5 miles in just over 50 minutes--a 10:05 ish pace. This afternoon, we went to the public pool. I wasn't sure if I wanted to swim, but I'm glad I wore my bathing suit, because it was super hot. So I ended up swimming the whole time with the kids. Eli wanted to go down the slide, and I stood at the bottom to catch him (it was 5 feet deep at that part). Then he was feeling brave and decided he wanted to try it on his own. So I stood to the slide, and he did great! He hit the water, went under for a second, and then swam 15 feet or so to the ladder. I was really proud of him for feeling brave enough to try that--normally, he only swims in water where he can touch the bottom. I have to say, I was very impressed with the lifeguards at this pool. They were VERY attentive, and they were constantly bobbing their heads, scanning the pool. I couldn't stop watching them--I kept trying to catch one of them not really paying attention, but that was never the case. They were always looking back and fourth, and even looking like they were counting people constantly. The pool had an open swim for 45 minutes, then 10 minutes for just adults, and then 5 minutes for just the lifeguards to swim. Then they started the hour over again. I think it's a great idea to break it up like that. The lifeguards even practiced their skills in the five minute swim break they had. Tonight, we're going back to the speedway. The race cars are doing figure 8's, which should be interesting ;) Jerry and I are heading home tomorrow. He doesn't have to be back to work until Sunday, so it will be nice to have a couple of days at home and get back to reality. 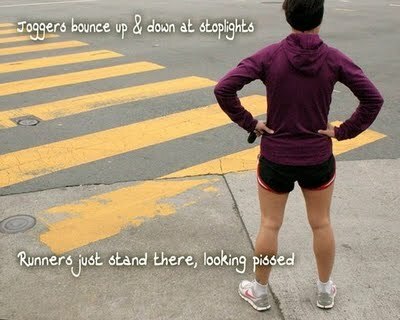 Love the joggers vs runners image...so true! That first picture is so awesome and so true. I hate the world when I run, so I am definitely that pissed looking person with her hands on her hips. Funny about the pool "schedule" too - I used to be a lifeguard, we had to stand for 8 hours, with 2x 10 min breaks & one 30 min break. I've never heard of a pool in NZ that has "adult-only" or "lifeguard only" time, is that common in the US? That schedule is the norm at pools in PA...I didn't realize that it wasn't the same everywhere! I hate stoplights! That's why I just run circles in the park a lot. It's boring but no waiting! Hehe. Sounds like a nice pool! I'd love to go for a swim right now, it's hot out today! I LOVE the joggers/runners pictures. I soooooo hate when I have to wait for a light (even more so when I'm on my bike)... oftentimes, I'll keep going down the side of the street and turn back around so I don't have to stop. That's why I've stuck to side streets, so I don't have to stop at traffic lights (and less people see me!)! I hate having to stop when I'm not ready to, so I avoid stoplights as much as possible. I avoid major intersections as much as possible or run across the street (jay walking?) whenever I can to avoid stopping lol. With stop lights, I usually just run up and down the block until it turns. Extra mileage and I don't have to stop moving.